A MUST SEE!! Welcome to the beautiful gated Community of Westbury in the City of Orange. 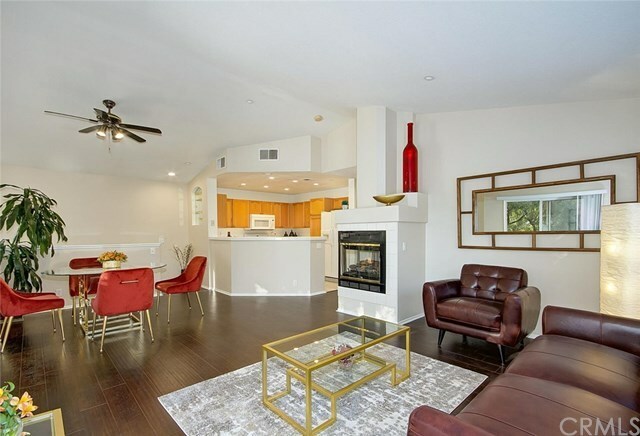 This light and bright Corner Unit has an open floor plan with high cathedral ceilings. Discover a cozy Home that offers 2 Bedrooms and 2 Full Bathrooms all on the same level. The large Master Suite features vaulted ceilings with ceiling fan, an oversized walk-in closet and a private deck. A second Bedroom and a full Bathroom. Kitchen with updated recessed lighting, oak cabinets, refrigerator and new microwave/oven. Newly upgraded laminated wood flooring throughout including stairs. New paint throughout. The private deck off the Living Room is perfect for catching an afternoon breeze and relaxation. Well-maintained Home with attached direct access, oversized 2 car Garage with washer/dryer hookups, a walk-in wine cellar, and lots of storage. Westbury HOA amenities offer 2 Community Pools, Spas, and a Clubhouse for your entertainment. Easy access to Dining, Shopping, and major Freeways. Located near Grijalva Community Sports Park and Santiago Creek Bike Trail. Close proximity to Chapman University and Old Towne Orange. This opportunity won't last!